I was twelve years old when my dad had a series of mini strokes, a direct result of a hard and fast lifestyle that saw him smoke, drink and work to excess, in keeping with his all-or-nothing personality. Or so I assume. In reality, I didn’t ‘know’ him at all. At that age you form opinions of your parents, but when I look back, I couldn’t say how he would have reacted to certain situations, or presume to know what his perspective would be, I was too young and he wasn’t around enough. He didn’t die that day from the strokes, but it altered our life as we knew it in every way. As happens with strokes, he was left with brain damage and could no longer use the right side of his body. He couldn’t speak, walk, work, drive etc. and his personality had changed completely. I don’t know where my dad went, but he didn’t come home with us after those months in the hospital, instead we had someone else. A few things go through your mind as a young person when something shocking happens. Some feelings you’d expect as natural – for example, I felt incredibly scared, everything had changed and my world was not as I knew it, any security I had felt was vapourised. My mum had changed, she didn’t have answers, she seemed sad, worrisome and in a constant state of doom. I also felt a great deal of guilt – I was the last person to see him before the strokes. He was helping me with my French homework and couldn’t find the right words which was so unusual, he said he didn’t feel well and we’d have to resume the next day, he wanted to sleep. On reflection this was the start of the strokes. Stupid feelings entered my head, does this mean the end of my pocket money, since dad was the one who paid out? Childish thoughts that concerned me for a brief moment until the magnitude of what we were dealing with truly struck home. I couldn’t speak to him or bear to look at him in the hospital – the first time I was brought in he was foaming at the mouth. I didn’t know this man, he wasn’t my dad. He didn’t speak and everyone looked grave and downtrodden when they were by his side, crying and fretful, people were visiting from afar that I hadn’t seen in years, it was confusing. I stayed in the family room and quickly became absorbed by my CD player, listening to the same albums on repeat until the batteries died. Every day changing the batteries to listen to the same songs, by the same bands, a constant rotation of Oasis, Pulp and Blur, these were the only voices I wanted to listen to. It got so that at nighttime I learned to sleep with the discomfort of ear buds in my ears while attempting some form of rest. In reality, I lay awake daydreaming of being on tour with my favourite bands as their drummer, or marrying Liam or Damon and ditching this awful reality that had become my daily existence. Things didn’t turn much brighter as dad returned home from the hospital. It was unfortunate timing to be going through puberty, and as a result the doctor suggested I had teenage depression. Ultimately there was no time or room to deal with me, there were far greater issues at hand. Mum quickly became dad’s full-time carer, my brother, nine years older, was finishing university exams and wasn’t going to move back home. Dad couldn’t speak, and I couldn’t speak to him, albeit I tried. We were told to practice with baby books, but this was incredibly frustrating for him, I can’t imagine my twelve year-old repeating the word ‘cat’ over and over and the word failing to find it’s way out. As months turned to years, I hadn’t developed skills enough to deal with what was happening at home. I spent time at friend’s houses and enjoyed the freedom of not being the main focus in the house. My grades were fine, but the school had noticed something wasn’t quite right. I was put on various mentor schemes and counselling with teachers – one mentor, a lovely lady working in the local community became my guide through my GCSE’s, trying to take the role of encouraging me to study and make plans and preparations. I found it a fantastic way to slip off for extra alone time with my music, “walking to her office” on the other side of town, without having to give real reasons to my teachers. That said, my exam results were great despite the fact mum wasn’t able to be part of the process, unable to parent in the way she would have liked, because dad was the main focus of our lives. I don’t mean this to sound bitter in the slightest, I revelled in the freedom this brought and made the most of it. When I turned 18 I met a wonderful man at work, Bryan, we fell in love quickly. I channelled my energy into breathing fully and living fully, it was refreshing. I still wasn’t speaking much, if at all with my dad, I couldn’t find the words. Although he had managed to learn his through the help of volunteer speech therapists. It hurt deeply to walk by him every day and have nothing I wanted to share. I just didn’t see my dad in him. I was cruel and heartless, and if I’m honest, I felt he’d done this to himself and robbed me of a fatherly presence. But Bryan entered the picture with little knowledge and immediately spoke to him, shared with him and did everything right. I started to thaw. My mum had to leave for Canada for the funeral of her father. I was devastated. I loved my grandfather, but we hadn’t been able to visit our family in years. In fact mum hadn’t been able to see him at all in the lead up to his death. This was the second time, the same had happened with her mum’s death. It fell to me to look after dad while she made the sombre trip to Canada, as it had the first time when I was so young – I was just as angry then, not being able to attend the funeral. I’m not sure where the NHS was in all of this, there were no nurses, carers or guardians available, or none that mum had found access to. Her entire family were thousands of miles away, there was no one to research these things, as I would think to do now. So this continued for years, he wasn’t meant to survive that long, but he did, he survived 10 years. He deteriorated significantly towards the end needing 24hr care, meaning mum would get up in the middle of the night and administer his dialysis three times in 12 hours, as the trip to the hospital was too much for him to handle. She was selfless, it was thankless and there was no help. He was also blind and in significant pain by this time, the cocktail of drugs working against one another. Meanwhile, I was graduating university and mum had no way of getting there. Finally at the last minute, the local hospital gave her 6 hours of care after questioning whether she really needed to attend. We set off at 8am, arrived in London for the ceremony and I drove her home as soon as it finished. We were back in time for the carer and that was the end of our celebration. I think we deserved so much more, I think it was a miracle I had made it that far in my education, that she had somehow succeeded in having a daughter with some glimpse of a future brighter than this reality. Soon after I was engaged to Bryan and it was clear, although the wedding was still a year away, that dad wouldn’t be part of it. I don’t remember if this was because we knew he was dying already, or because he would inevitably be too sick. I suspect it was the former. A few months later Bryan and I were on holiday in Turkey and my brother called his mobile. I knew something was wrong immediately and answered it. “Mum didn’t want me to tell you, but dad’s in hospital and refusing all medication, he won’t last long.” Our flight home was the next day. I cried and cried and cried for this man who I had ignored for the past 10 years, who hurt me so deeply because he had hurt himself and had hurt my mum. He had said some ugly words about her in his last few weeks. I was looking after him one afternoon and took myself into the shower, fully clothed to cry my heart out as the torrent of abuse he had stumbled to put into broken, breathless words punctured my soul. She was an angel to dedicate her entire life to him in the way she had. Mainly, I cried because he just wasn’t the dad I had thought of at 12 years old. The funeral was held at our local church and I wrote a piece to celebrate his life for my brother to incorporate into the eulogy. I can’t bring myself to read it now, I don’t remember what it said. It took everything to ignore those final words he’d said to me about my mum, but I had grown up fast and I knew it was the drugs and his deep depression at being alive that was really coming through. I told no one, not even Bryan. Throughout the years since, I’ve often looked for photos of dad, pre-stroke, to remind myself of the person I knew, I guess you get naturally curious as time starts to heal. Unfortunately, he wasn’t one for posing for pictures and as a family, we weren’t ones for taking many. That is something I feel sad for. I was encouraged not to ask many questions about my parents relationship, but it was clear it wasn’t a happy marriage, making mum’s commitment of care all the more incredible. She truly is a wonderful person, dealt so many blows by life and that certainly wasn’t the last. Bryan and I married a year and two months after his death. It was the happiest day of my life at that point. 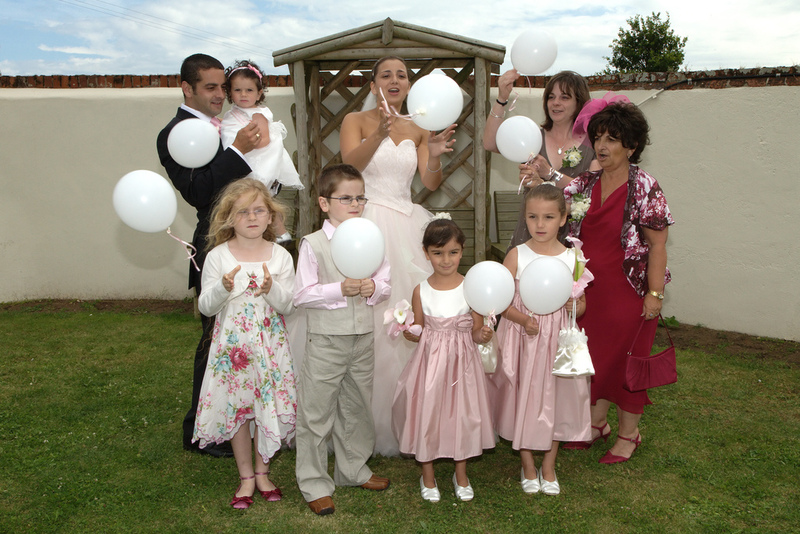 My uncle from Canada walked me down the aisle and we let white balloons into the air to mark dad’s absence. It was difficult, I missed him that day, but in all honesty, I’d missed him the full 10 years he had been sick. I missed what a dad stood for, I missed his presence, I missed his advice I imagined he would have given me. It was a strange precursor to the grief that followed when he did leave us. I’m sorry this wasn’t an uplifting tale, in reality, every chapter of my life has been a lesson and a teaching that I now view as a blessing. Maybe not the typical kind of blessing you’d first think of, but they are moments that led me to become the person I am today because they form part of my makeup, and for that I welcome all that has gone before.